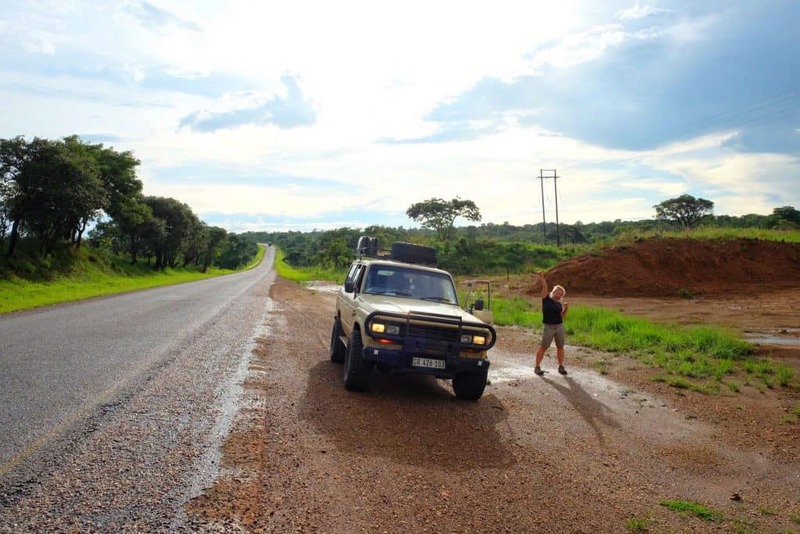 By the time we reached the Malawi border I fell to my knees and almost kissed the ground. We’d had a rough couple of days driving in Zambia after discovering we had driven 1100 kilometers in the wrong direction. The result was a total re-route to our trip in Africa. The border post felt like a miracle because there was zero information on this border post, anywhere! I’ll start from the beginning with hopes that no one will make the same mistake we did. 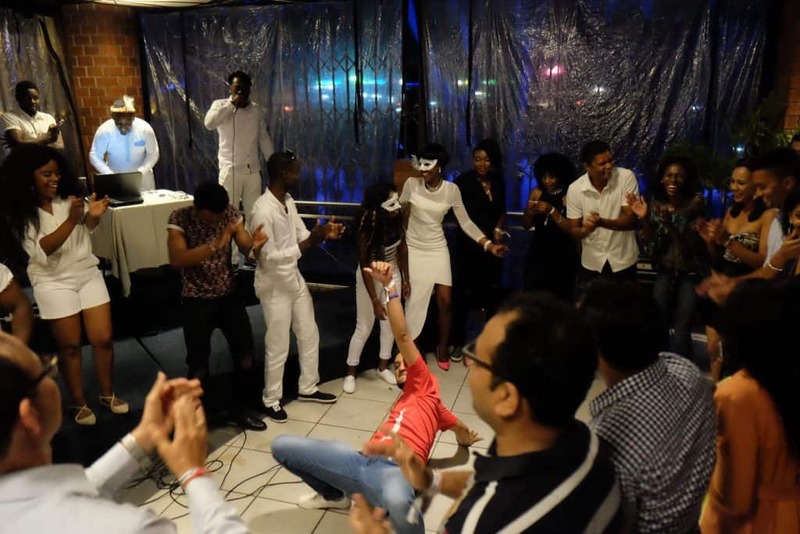 We spent a week holed up hiding from the rain in the Protea Hotel Lusaka Tower. We had made the decision that New Year’s Eve would be fun in the capital city and we were craving good WiFi, health food, and a movie theater. Which is exactly what we got in Lusaka. We had another week until we were supposed to visit the amazing South Luangwa National Park before making our way into Southern Malawi. We had been very eager to visit both destinations. We were almost guaranteed to see Leopards at South Luangwa by the multiple guides we had spoken with. 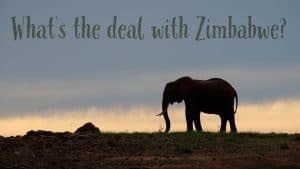 Not wanting to spend another whole week in Lusaka, we decided to head north to Kasanka National Park and Mutinundo Wilderness reserve before crossing South Luangwa park. 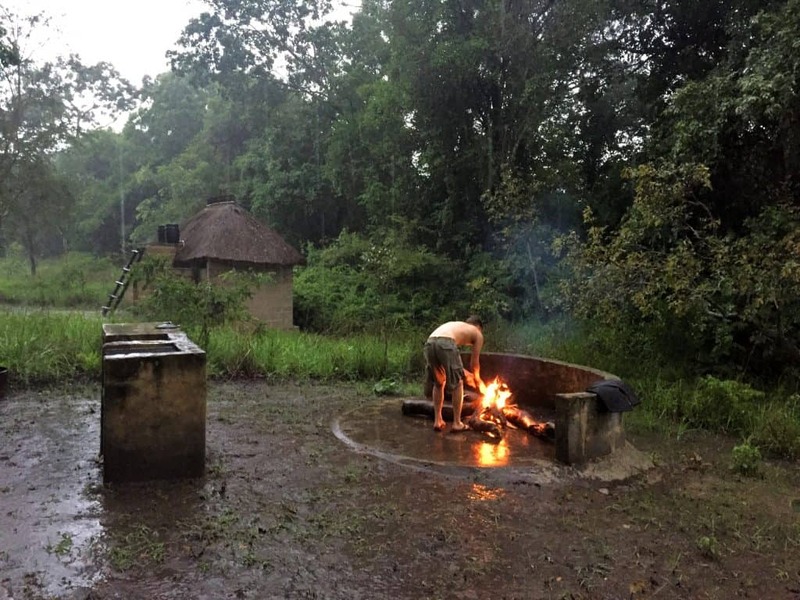 January in Zambia…the rainy season. The rainy season had yet to affect us, but once we got to Zambia we saw what all the fuss was about. We had driven 16 hours through the mud around Lake Kariba on some of the worst roads of our life. Thankfully, we have a trusty 4×4. 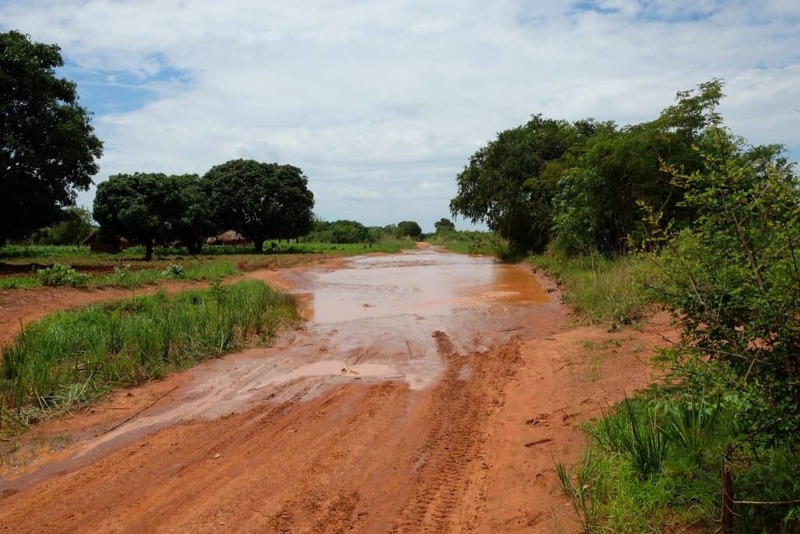 So when we made our way to Kasanka National Park the rain and the mud were no different. The largest mammal migration takes place every year in December at Kasanka. Millions of bats come to the swamp land and viewing the wildlife spectacle is supposedly incredible. We knew it was the beginning of January, but we thought we may still catch the winged creatures at Kasanka. We left Kasanka with an empty wallet and zero photos of wildlife. It was still a beautiful spot in the untamed bush, we just wish we could have been there at a different time in the year. We drove towards Kundalila Falls to see the view over the Luangwa Valley. When we finally saw the dilapidated sign for the falls we hung a right and made our way 13 km on the mud track. Almost every single Zambian we passed either stared hard daggers at us or held their hand out screaming “money” as we drove past. I suppose it was the first time they had seen a white traveller in awhile. We made it to the entrance way to the falls when a lone man appeared. He told us it would be 150 Kwacha ($15) a piece to walk down to the falls and 50 Kwacha ($5) to leave our car sitting in the big empty dirt car park. With another reminder of the price gouging in Zambia, we declined to pay $35 to see the falls and continued on our way. We made it to our next destination, Mutinondo Wilderness, awhile later. I told them we just needed one night at their campsite. Without them asking I decided to tell them of our future plans (and thank god I did). The two Dutch managers stared at me. I stared at them, I looked at Cam, I stared back at them. I think I giggled a little in between…they had to be joking. “There has to be some sort of way to South Luangwa?” We were literally right next to it! I continued to tell them that we just came from Lusaka and couldn’t even imagine paying the crazy petrol prices or taking the time to drive all that way again. You see. 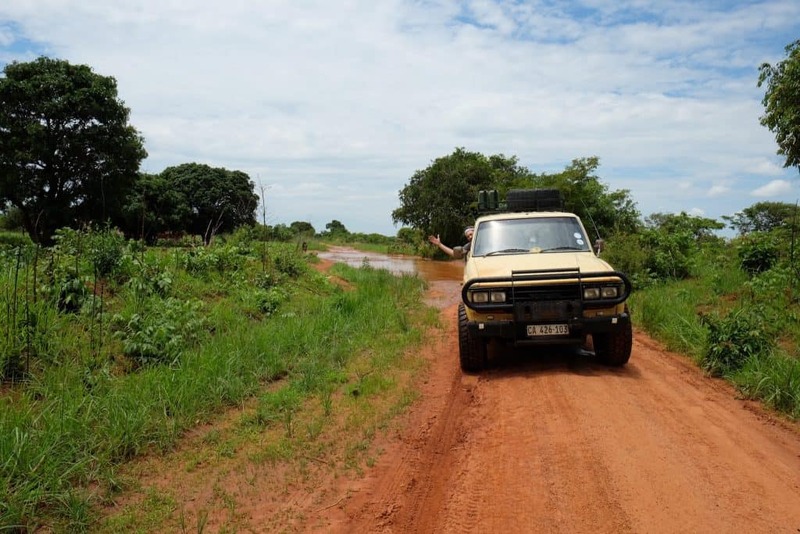 There is a road between Mutinondo Wilderness Area and South Luangwa – even paper and Google Maps confirms it. 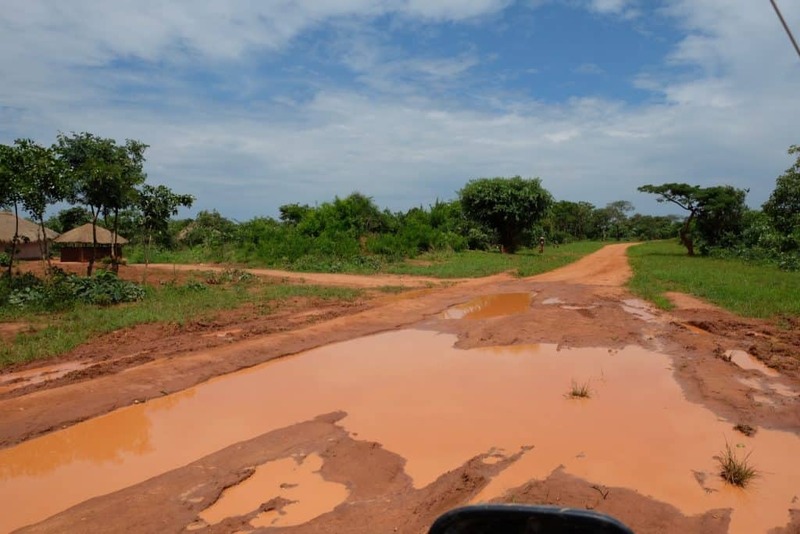 But see, it’s the rainy season in Africa, meaning the normal bad mud roads are now bad brown mush roads that are totally impassable. The road we thought we were going to take is only open three months out of the year. Traveling along it any other time is pretty much signing a death certificate. My friends, this is why you cannot just “wing Africa,” which I see so many people claiming they want to do. This is also why I really really wish Cameron and I were more bush smart and could just know this things like the other overlanders we meet. After an hour of kicking ourselves and having a little cry (and a strong gin and tonic), we decided that we would have to cut out South Luangwa and Southern Malawi. With petrol in Zambia costing a whopping $1.40/Liter (over $5 a gallon) and time being a precious commodity, we would continue to northern Zambia before trying to cross over into Malawi from the north. We had to make the most out of our mistake so we spent a few fabulous days hiking in between the rain near Mutinondo before making our way up to Kapishya Hot Springs. From the hot springs, we were to drive into Malawi via the Chitipa border. The Chitipa border exists on a map, but outside of that, I couldn’t find any info on it. 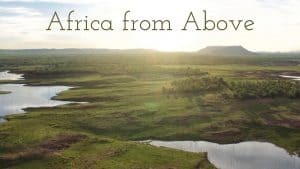 Some of the Africans we asked mentioned that the border post may, in fact, be absolutely nothing, and when I asked in the Overlanding Africa facebook group no one had been through the border. This is Africa and things don’t always make sense. Even though there is a border post on the map doesn’t mean there is one in real life. I was beginning to stress how we would make it into Malawi legally with our car and once again cursing myself for not making it to South Luangwa so I could cross over the “easy” border post at Chipata. 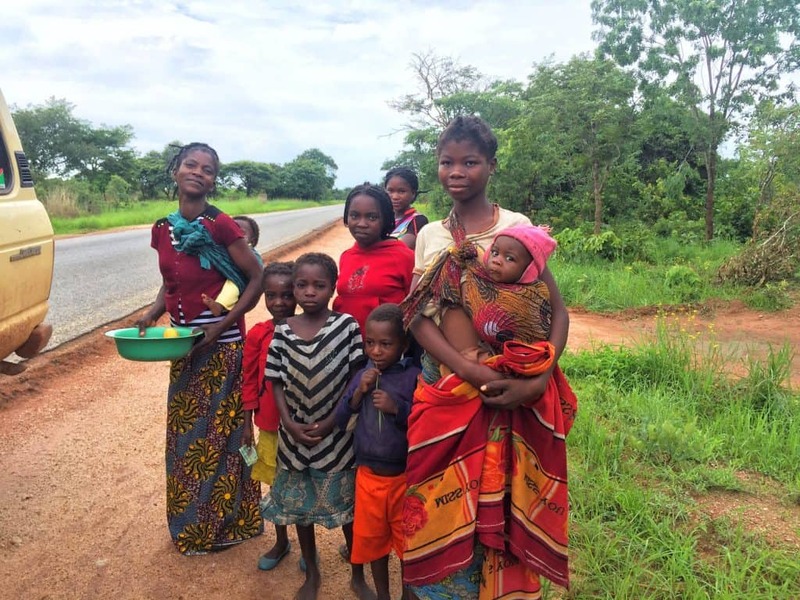 With nothing lose…besides a ton of gas and time we awoke at 5 am and made our way towards Malawi. We drove from Kapishya Hot Springs towards the Chitipa Border post. We stopped in Chinsali knowing this would be our last chance to get fuel. We followed Maps.me the whole time which is extremely accurate for bush driving. It takes three hours to get from the hot springs to Isoka. From there we turned off onto a dirt road. If you make the same drive then pray that it hasn’t rained in the past day because this road is long and muddy. It took us 2.5 hours to drive 114 km through what seemed like fifty small villages. My doubts started to get ahold of my mind so we pulled over so I could ask someone. We found a young Zambian on one of the coolest motorcycles I had ever seen. 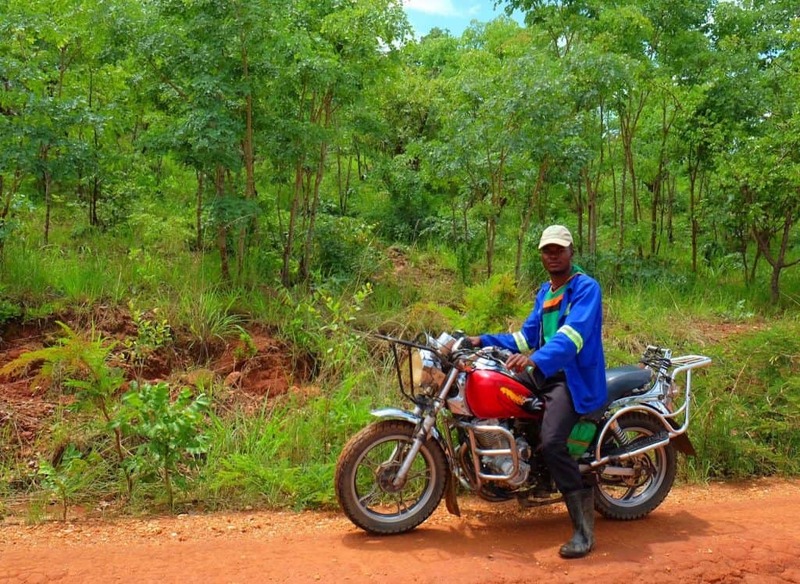 He told me we were heading towards Malawi, and that was good enough for me to keep going. 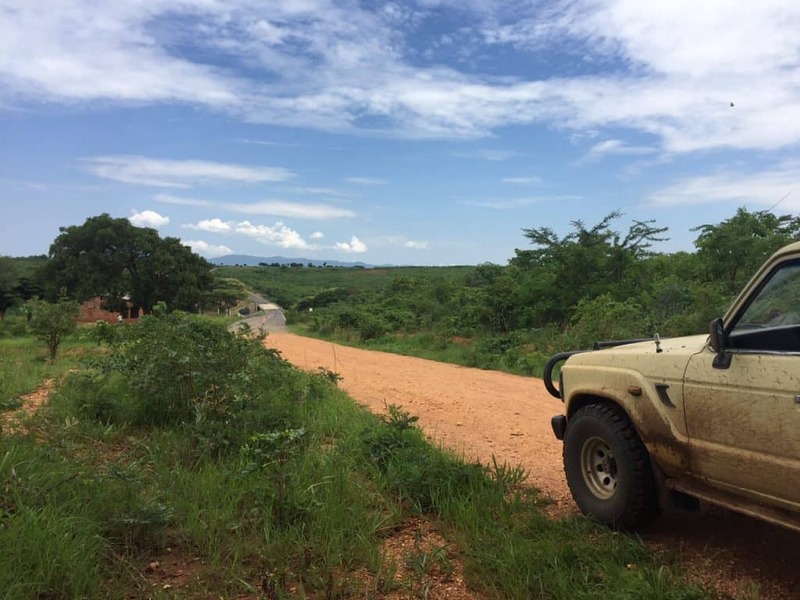 We never saw one single car the entire way, but we eventually made it to Malawi. 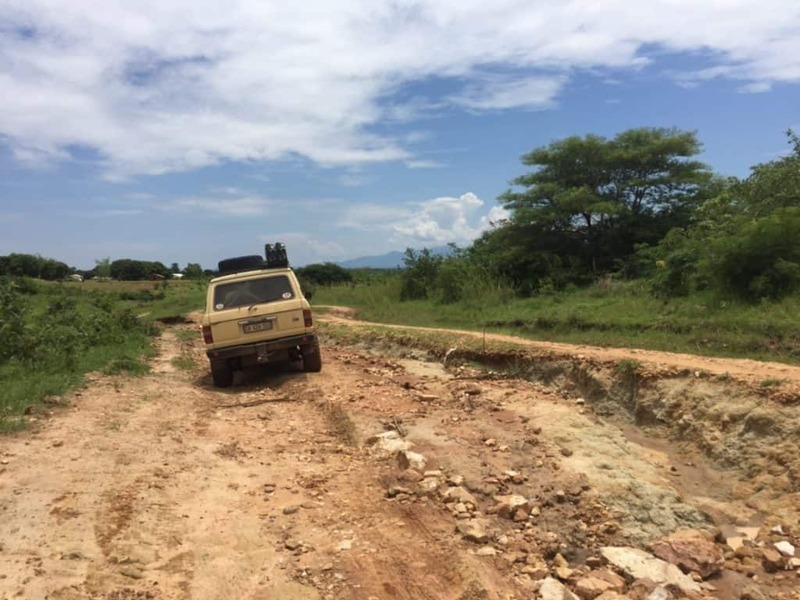 I knew we made to Malawi not because of a large border post, but because I finally saw a pristine tarred road (yes, most of the roads in Malawi are tarred). The border post does exist! We quickly stamped ourselves and our car out of Zambia, and I could sleep sound knowing I didn’t have to enter or exit a country illegally. 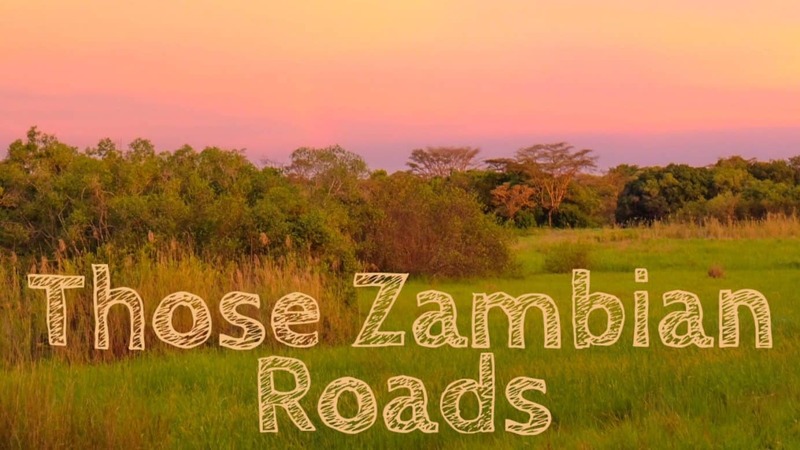 Once you hit the tar road and stamp out of Zambia, the Malawian border post is 7 km further. The guards were all playing a game of bao when we rolled up and were some of the friendliest border guards I’ve ever come across. The visa fee for Americans (and many other nationalities) is now $75 paid in USD only, with bills only from 2013 or newer. To get the car in we had to pay 10,000 Malawian Kwacha for temporary import permit, payable in Kwacha only. We didn’t have any local currency so the border guard let us go to the nearest ATM to pull some out. We had Comesa (third party insurance in Africa), which we flashed at the police officer on duty who seemed to care about his Facebook updates more than us. We experienced no runners at the Chitipa border and absolutely no hassle. It was honestly my African border post of dreams (unlike the border coming into Zambia). Even though we drove 1100 kilometers in the wrong direction, skipped Southern Malawi and South Luangwa, we are now on the shores of Lake Malawi sipping on cheap mojitos and kicking back on the clear blue water in the warm heart of Africa.